Presenting you an exciting new ben 10 game to enjoy another great alien adventure. It is the Ben 10 Big Chill Rescure game. Fly above the freezing sea and chase down the evil Vulkanus to get your powers back! For this adventure, Ben has turned into Ultimate Big Chill who can fly at lightening fast speed! Wanna start playing this game, wait for a moment and first check out the gameplay details. The evil Vulkanus has stolen the super powers of Ben and escaping through the sea route. Ben knows if he loses his powers, no one can defeat the Vulkanus’ aliens. To chase Vulkanus in the freezing sea, Ben needs high speed as well as protection against ice. That’s why he transforms to Ultimate Big Chill. He can fly at great speed and able to manipulate icebergs with his fire powers. You must help the Ultimate Big Chill to rescure his stolen powers to win this game. Ben 10 Big Chill Rescure is a great flying adventure with multiple levels where you have to maneuver the ultimate alien Big Chill as he chases the Vulkanus. All this happens over the freezing cold ocean with icebergs and deadly rocks. All you have to do is just use the arrow keys to move the ultimate big chill and avoid hitting them. Your score depends on the number of omnitrix orbs that you collect. In this ben 10 game, each level has target number of orbs to be collected and you get only 3 chances to clear each level. Whenever, you’ll hit an iceberg or a rock, a little amount of life gets lost. So, make sure you hit into the rocks or icebergs as less as possible. If you could not achieve the given target in 3 lives, you will fail and the level restarts. As Big Chill, clear all the levels to recollect your powers from Vulkanus and win the game! 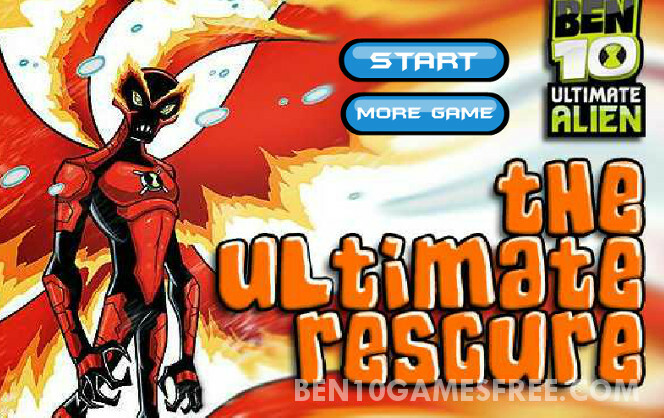 Don’t Forget to give your rating for Ben 10 Big Chill Rescure game and share your tips and tricks to win this game in the comments section below.